And we are blogging from New Delhi again! Still very sleepy and exhausted, but I don't want to sleep! I'm loving the pleasant weather and it's so good to hear the sounds of honking traffic outside. Our neighborhood in Newcastle is on mute compared to the streets in South Delhi. Masala Maggi Noodles ~ Because I've missed it since November. You can get it in the UK, but you have to order it online (3-4 times the price in India) or go to some Indian shops...forget it. Cosmopolitan Magazine March 2013 Issue ~ Because it made one of my teenage dreams come true! Hope you all liked my take on Two-Tone Lips. As shown, I used Inglot Lip Paint #59 & MAC Marilyn Monroe Scarlet Ibis Lipstick. The video on this whole look- makeup + hair will be posted soon. Yes, that "trailer" I made was for this =D If you haven't seen it yet, you can go watch it on my channel HERE. THANK YOU SO MUCH everyone for checking up on my blog and making my day, everyday. 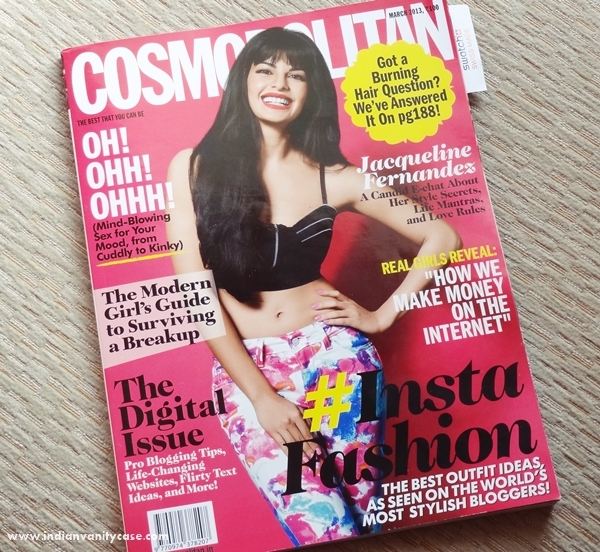 This issue of Cosmopolitan is called 'The Digital Issue' and it's all about the internet & social networking. A lot of other beauty bloggers and fashion bloggers from India & around the world are in it. You will love it if you use Facebook, Twitter, Skype, Instagram, Youtube.... and you will love it even more if you like finding new blogs to read. congrats CZ..i feel so happy for u..
the best thing that i like is the way u do ur post..in a fun way,exciting and we,as readers are always curious to knw what u are upto!!! That's so sweet of you Ritika! Thank you! Hey Congrats CZ..thats amazing ! And great work on the two toned trend.. 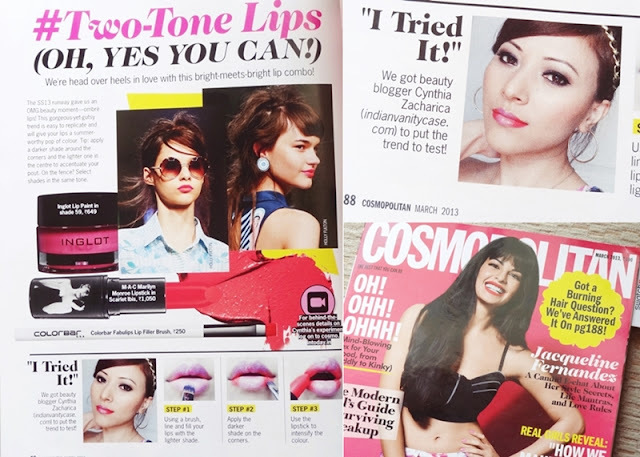 This is not the first time you are featured in Cosmo right? Welcome back!! There's no place like home, right? i got the issue today.. was so happy showing my fellow bloggers to my frnds hehehe..
congratulations CZ.. wish you lots more success and fame..
Congrats for getting featured! Hope you're doing well!